Like many other meteorites from Northwest Africa this meteoritic iron has a misty find history. In spring and summer 2008 several Moroccan meteorite dealers started to offer individuals of a new meteoritic iron. 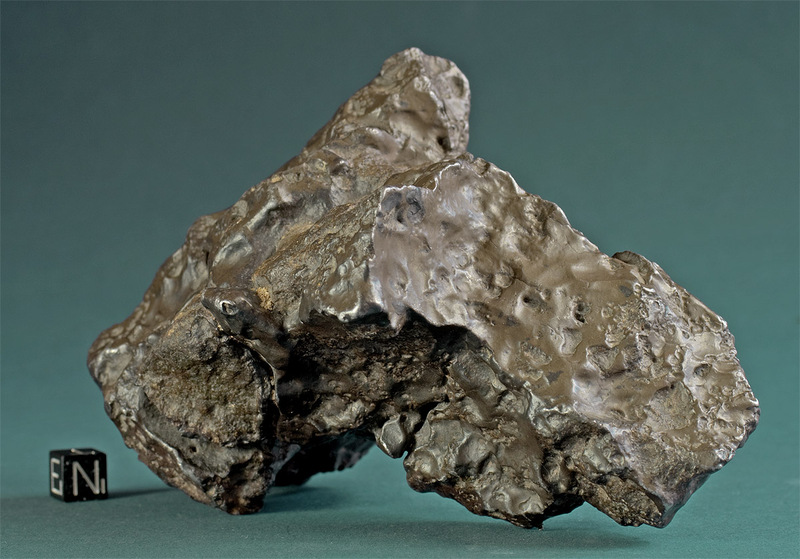 While two sellers could not provide any background Information, one seller at the Ensisheim/France meteorite fair in June 2008 told us that to his knowledge, the irons represented new finds from the area of the Ziz IAB complex meteorite (NWA 854). The Moroccan dealer was so kind to inform us that a lab analyzing the metorite on his behalf had arrived to the conclusion that the new material is structurally identical with Ziz (NWA 854). The same dealer on our request was so kind to forward us the certificate issued by the Etudes Metallurgiques et de Traitment Thermique (EMTT). The judgement of the EMTT, as meanwhile confirmed by the lab, refers to a basic structural indentity of the new meteorite with other coarse octahedrites of the IAB-complex only (of which Ziz is one). This, however, is also true for most of the other 218 meteorites in this large group. Macroscopically there was strong evidence that the newly discovered masses represented a different fall. The above image shows a 1,873g specimen of the recently found iron meteorite while being cut on a diamond wire saw. Both an endcut as well as two slices for classification purposes were expertly cut and prepared by Marc Jost in Switzerland. 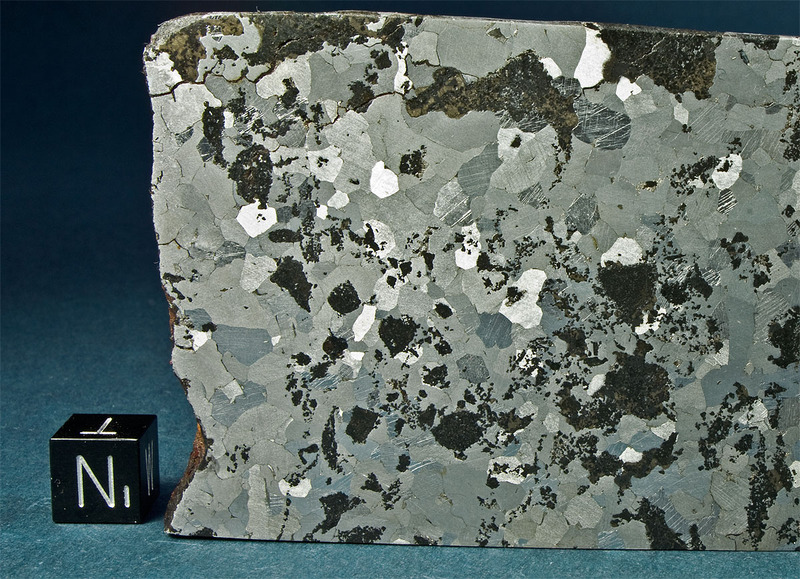 As can already be seen on the untreated cut surface the meteoritic iron displays a number of irregularly distributed inclusions. As the polished and etched surface of the pictured cut section shows, the new iron is intersected by numerous silicatic inclusions which make up to 45 volume percent in some of the masses recovered. The silicatic inclusions are rich in olivine with crystals up to 2.25 mm in diameter. These inclusions are one of the reasons to doubt that the newly discovered irons reprensent part of the Ziz meteorite (NWA 854). We have contacted the current owner of what appears to be 90 percent of the original Ziz finds who confirmed to us that none of his idividuals contained any silicate phases. We also contacted the Etudes Mettalurgiques et de Traitment Thermique (METT) in France in this matter, which is the lab that worked on the original Ziz irons. Mr. Dransart from METT was so kind to confirm to us that none of his samples of Ziz (NWA 854) contained any silicate inclusions. Besides the inner composition there are certain other features which suggest that the new irons in fact represent a different fall. Most probably from a different find location as well (the Ziz river runs for more than 300 miles through eastern Morocco and continues across the border through a large part of Northwestern Algeria). While the Ziz (NWA 854) irons display an almost fall fresh appearance with smooth regmaglypted surfaces only coated by a chestnut colored patina, the new irons are sometimes heavily eroded by the environmental forces. As can be seen in the images, the texture of the iron surfaces is alternating from undulating surfaces smoothened from atmospherical ablation to a coarser pattern, where corrasion (sand abrasion) has eroded up to ~2 mm of the original material (No α2 zones could be found on examining the etched cut surfaces). Iron surface areas that were in situ protected from corrasion have developed a chestnut colored desert patina. Iron surfaces altered through corrasion, which represent the majority of the surface, show a matt-finished slightly olive luster in which the lamellae boundaries are apparent. The boundaries of iron and silicate portions are exaggerated through chemical and mechanical weathering. Obviously, the silicate portions have lost a higher ammount of surface material in this process. The described surface alterations suggest the involvement of a considerable ammount of wind born sand. But the more critical fact is that it takes some time until these erosion features can be observed on an iron meteorite. Given the new irons have indeed been found in the region of the original Ziz finds, then their respective fall appears to be orders of Magnitude older, or otherwise, their find location must represent a considerably higher erosive environment. An extensive paper titled “Expertise and Analysis of a Sample of Ziz Meteorite” (EMTT, 2000) on the Ziz (NWA 854) iron meteorite was kindly provided by fellow meteoriticist Marcin Cimala from Poland. One of the inereresting results the EMTT presented is the fact that the spectrometric analysis determined an unusually hig ammount of germanium (640ppm) in NWA 854. Petrography: (C. Herd and G. Nadeau, UAb) The meteorite contains abundant silicate inclusions. The metal consists of coarse-grained (~5 mm width) equigranular kamacite grains with 120° grain boundaries. 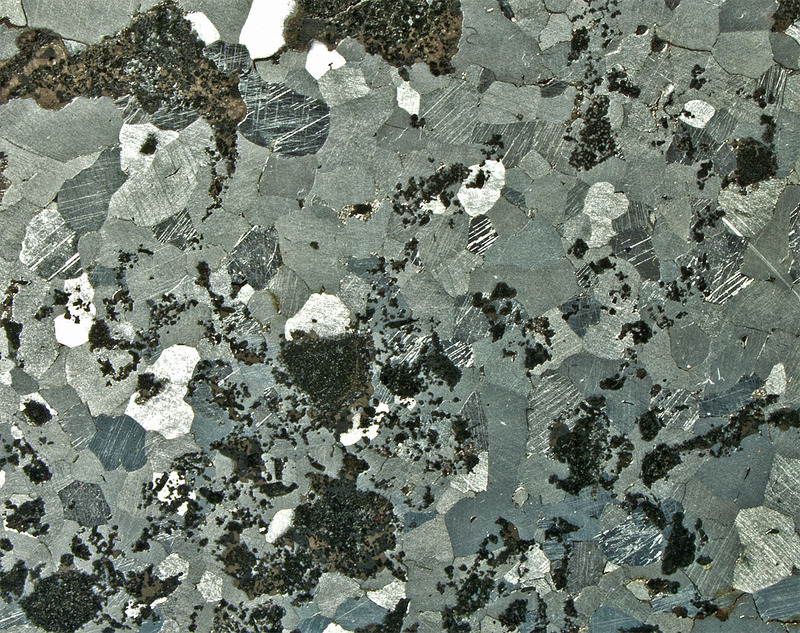 Neumann lines are visible within individual kamacite grains. Small (sub-mm) schreibersite grains are present within some kamacite grains and at grain boundaries. Silicate inclusions consist of irregular, mm- to cm-scale masses of fine-grained (<0.2 mm) material intergrown with kamacite. Terrestrial oxides decorate grain boundaries and fractures that penetrate well within the meteorite interior. Geochemistry: Mineral compositions (all mol%): Silicate inclusions consist of homogeneous olivine (Fa4.9±0.2), low-Ca pyroxene (Fs6.9±0.3Wo1.8±0.3), clinopyroxene (Fs3.0±0.1Wo44±1), and plagioclase (An15.7±0.1Ab81.2±0.1). Also associated with the silicate inclusions are abundant troilite, kamacite, schreibersite and graphite, the latter either fine-grained massive or cliftonitic (as intergrowths with troilite). Modal abundances in the one silicate inclusion studied in detail are approximately 30% olivine, 15% low-Ca pyroxene, 15% Ca pyroxene, 15% graphite, 10% troilite, 10% iron oxides (terrestrial), 3% kamacite, 2% plagioclase and trace schreibersite. Bulk Composition (metal): INAA data (J. Duke, UAb): Ni = 6.28 ± 0.04 wt%, Co = 0.441 ± 0.003 wt%, Ga = 81.2 ± 0.6 μg/g, Ge = 377 ± 34 μg/g, Ir = 3.55 ± 0.04 μg/g, Au = 1.51 ± 0.02 μg/g, As = 11.0 ± 0.2 μg/g, W = 0.72 ± 0.13 μg/g, Re = 0.33 ± 0.04 μg/g (uncertainties 1σ, 68% confidence level). Classification: Iron meteorite, IAB main group, low shock, moderate weathering. Silicate inclusion mineralogy is consistent with IAB-MG. The lack of Widmanstätten pattern precludes structural classification.